On October 11th Snowdome held its first educational event to help support the work being conducted to bring blood cancer clinical trials and research to Western Australia (WA). 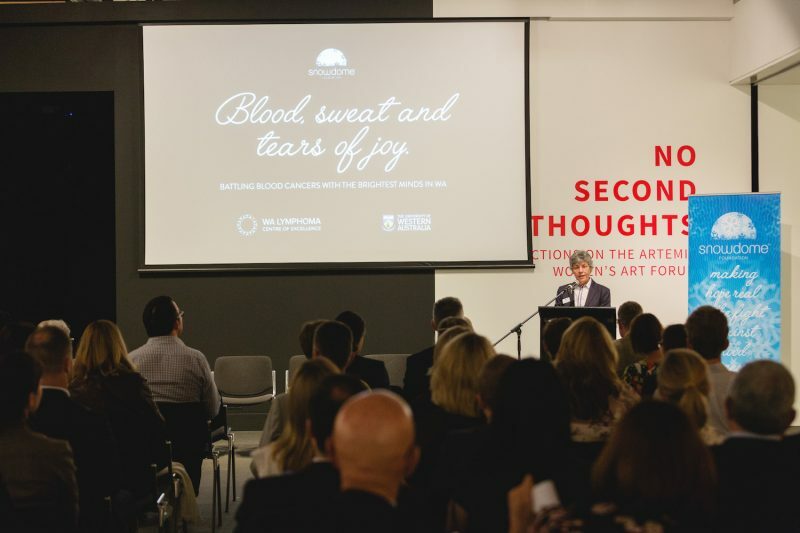 The evening was hosted by Professor Wendy Erber, Executive Dean of Faculty of Health and Medical Sciences of the University of Western Australia (WA) in the incredible Lawrence Wilson Art Gallery. Professor Erber opened the evening emphasising that Australia is renowned for its innovative and ground-breaking research. However, she reminded the audience that this reputation can only be maintained if we continue to invest in current and up-and-coming researchers. University of WA and Snowdome partnered to support Dr Chan Cheah in his quest to bring blood cancer clinical trials to WA to ensure WA blood cancer patients have access to next-generation treatments. In order to do this, he has created the Western Australia Lymphoma Centre of Research Excellence (WALCRE). Dr Cheah acknowledged that Snowdome really is helping blood cancer patients in WA. He highlighted that traditionally WA had far fewer lymphoma trials per million population, than for example, Melbourne and he was driven to change this. Through the establishment of the WALCRE in less than 6 months the number of blood cancer recruiting trials has gone from 8 to 19 across the three participating sites, Linear, Sir Charles Gardiner Hospital and Hollywood Private Hospital. Ultimately this alliance of clinical trial sites will provide WA blood cancer patients with access to novel therapies via clinical trials to help patients live longer, better lives. Dr Cheah closed by encouraging the audience to visit the website for information regarding the centre and trials on offer. Dr Carolyn Grove explained the importance of an accurate diagnosis as the key first step to curing blood cancer. The use of genomics has helped immensely in ensuring an individual’s blood cancer is diagnosed and classified in order to determine the correct treatment and management plan. If we understand the biology of blood cancer we have a better chance to treat it with a targeted therapy. Haematologists are now integrating genomics into everyday clinical practice so they can classify haematological disease better. We can now identify patients at high risk of disease and pre-empt this from developing further by delivering treatment earlier. New treatments such as Imatinib have transferred the outlook for patients with Chronic Myeloid Leukemia (CML) from a fatal disease to a chronic disease with a life expectancy of over 20 years. Dr Grove went on to explain the use of targeted treatment by using an analogy about destroying an unwanted tree in the garden. Your options include using a toxic herbicide however this requires you spray the whole area and in the process the poison you have used will damage and destroy other parts of your garden. You could be smarter and use a smaller amount of poison injected directly into the trunk of the tree but the best approach is to learn about the specifics of the tree. When we understand the precise species we can be more targeted. For example, to kill a Frangipani tree you simply flood the root system with water. This is what we are now trying to do with cancer as we understand the disease better, we classify it better and as a result we use the right drug to cause the least harm to the patient. This is known as a targeted treatment. Dr Cheah noted how access to new treatments coupled with the number and kinds of therapies has dramatically improved over the past 5 years. In general, new treatments are tablets that have much lower levels of side effects than chemotherapy. Access to these newer targeted treatments has never been better in WA. Dr Brad Augustson explained how far we have come with the management of myeloma in the past few years. Fifty percent of people are still alive 10 years post-diagnosis as a result of advances in treatments and our understanding of genetic chaos. This has enabled us to be more pre-emptive with treatments resulting in better outcomes for patients. Gavin Gull elaborated further discussing the results they are now achieving with Ibrutinib in the management of chronic lymphocytic leukaemia (CLL). This new class of treatment is a targeted therapy that attacks the CLL cells, enabling patients to live longer and have a better and improved quality of life on treatment compared to chemotherapy. For patients it is a time of great hope. Clinical trials in the oncology space are moving more rapidly than in the past. Our understanding of the genome and the way certain treatments work allows the clinician to target the right patients for the right treatment. Furthermore, treatment strategies during the trial can adapt to enable all patients to receive the best care and treatment possible. However, barriers still exist in the research world making it challenging to move as fast as researchers, clinicians and patients would like. Lymphoma patient Rita Zuks, discussed her bumpy blood cancer journey with the audience explaining that she has had Hodgkin Lymphoma then Non-Hodgkin Lymphoma and now diffuse Large B cell Lymphoma. After exhausting all treatment options Rita was referred to Dr Cheah and included in a clinical trial back in 2016. Sadly, after 15 months of remission, her cancer returned once again. Rita is in a new trial and is hoping it will allow her to spend as much time as possible with her two gorgeous grandchildren. Rita is grateful that the clinical trials have brought her quality time with her precious family. David Joske summarised the evening by highlighting how far WA had come in such a short period of time. This is a result of the various teams partnering together with an aligned vision and generous funding to make the WALCRE a reality not a dream. David is hopeful the WALCRE can provide better outcomes for WA patients with blood cancer by speeding up access to new treatments. The WALCRE has a target of raising $1million per annum to secure the personnel required for blood cancer clinical trials to be conducted in WA. We hope you share our dream of increasing access to next-generation treatments via clinical trials in WA to ‘make hope real’ for WA blood cancer patients.